Can’t decide which novelty best suits your needs? 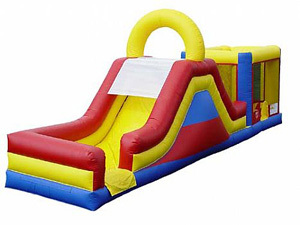 Have the best of everything with this unique 3-in-1 combination of a Bounce House, Rock Climb, and Slide. Kids of all ages will enjoy the simultaneous variety. When they get tired of one activity they simply move on to the next. This has become one of our most requested inflatable items because of its great versatility.